HeLa cells infected with Influenza A virus. RIG-I and MAVS co-localize with the mitochondria. 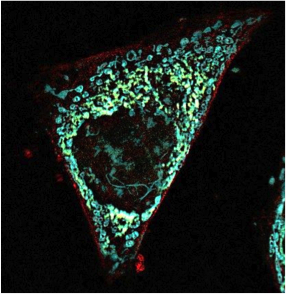 Structured illumination microscopy (SIM) fluorescence. Image acquired with a 63x objective. Detection of virus by the innate immune system leads to the production of type I (α/Β) IFN, which is critical for limiting viral replication and spread. IFN-a/b binds to the type I IFN receptor expressed on all nucleated cells, leading to the induction of hundreds of IFN-stimulated genes that limit viral replication and create an “antiviral state.” Despite the importance of type I IFN during viral infection, may questions remain about its induction and function during virus infection. Work in the García-Sastre lab is currently focused on understanding the induction pathways for type I IFN during viral infection, regulation of IFN signaling by host proteins, and cell types that respond to IFN during viral infection in vivo.